Recruitment to radiology is through a national process coordinated by London Recruitment, run on behalf of the Royal College of Radiologists. The application is submitted as a single unit of application (UoA) on the ORIEL recruitment system. The application form itself for radiology is fairly straightforward. You are required to enter your details and provide references, ensuring that you meet the eligibility criteria. Full person specification can be found on the Royal College of Radiologists website on the Specialty Recruitment page. The 2018 person specification can be found by clicking here. Once your application is submitted, applicants pass through several stages of competition including longlisting, shortlisting, the Specialty Recruitment Assessment (SRA) and interviews. Below is the expected timeline for the 2018/2019 application process. All applicants who are longlisted will be invited to take the Specialty Recruitment Assessment (SRA). This is an online examination (taken at Pearson VUE centres across the UK) that has been adopted by multiple specialties in recruitment, to include General Practice, Psychiatry, Opthalmology, Neurosurgery and Radiology. It is a two part examination consisting of clinical scenarios (75 minutes) and professional dilemmas (110 minutes). The clinical scenarios cover a range of medical, surgical and specialist subjects. The format of this part of the examination is multiple choice questions (MCQs) and extended matching questions (EMQs). For MCQs, you will have a choice of around 5 answers. For EMQs, there will be a longer list of possible answers, to which you have to match a series of one to three questions. The examination will test your knowledge to the standard which is expected of a Foundation Year 2 doctor. Hence, you should not have to stress about revising for this test to the extent you may have for your medical finals, but brushing up on a few areas you feel week on is certainly worthwhile! It is noteworthy that the clinical scenarios section is 75 minutes long and consists of 86 questions, so you need to be able to recognise things very quickly – you don’t have much thinking time! If you are unsure, it is worth going to the next question and going back later (which is easily done on the electronic system) to re-attempt the question. Following the SRA, a large proportion of applicants will be invited for interview with only the lowest scoring candidates being ejected from the application process. A useful website containing advice for applicants to Radiology is Radiology Cafe. Please click here for more details. The Radiology Specialty Training Interview is undoubtedly the most nerve wracking part of the application process, but also the most important. In recent years, the total SRA mark has accounted for 1/3 of the overall mark with each interview station accounting for 1/3. Your preparation should include preparing your portfolio (see below), preparing answers for example questions and improving your overall interview skills. There are plenty of ‘How to Get into Radiology’ Interview courses running across the UK and we highly recommend attending at least one, especially those which provide mock interviews. 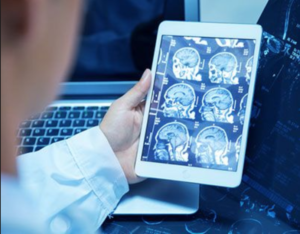 Ultimately, the interview process is looking to see that you are keen to be a Radiologist and understand what your future career will entail, both the good and the challenging. You will (hopefully) be the interviewers’ future colleagues so they are also looking to see that you are a hard worker and personable applicant. For the first category, marks were awarded based on time spent in radiology departments e.g. during taster sessions or any previous experience. Based on my personal experience in the interview, it seems that the most desired experience would be in different radiology departments across different sites over a greater length of time (e.g. an elective in radiology, taster weeks at different hospitals). 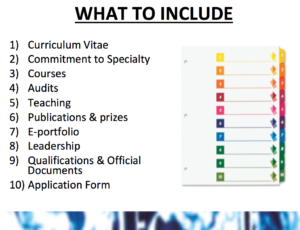 The second category looks at any additional degrees you have, and also postgraduate medical qualifications e.g. MRCP or MRCS examinations. Points are awarded based on the degree you achieved and any examinations passed. In the 2017 process, maximum points were awarded if you had a first class BSc (or similar) PRIOR to starting medicine (i.e. not intercalated), or if you passed part 1/part A of MRCP or MRCS respectively during your foundation years. For the third category, it is best that you try and complete an audit and close the loop to attain maximum points. For teaching, maximum points are gained through teaching as part of a programme/series of sessions or on a national basis. Teaching qualifications are also recognised in this category. For the final category, points are awarded for research degrees and also peer-reviewed publications, with first-author publications achieving the maximum marks. This station lasted 10 minutes, and the form only takes a few minutes to complete. Hence, it is worthwhile taking this time away from the other candidates to compose yourself and prepare for the next interview station. Note that the self-assessment form you complete in this station is carried with you to your next stations and will be reviewed in station 3 – the portfolio station. This station took form of a classical interview, during which you were asked questions by a panel of consultant radiologists. I had two consultants on my panel – one of which asked questions and they both marked my responses. I was only asked three questions in this station, and was signposted of this before we started. This is important as it enables you to gauge how long your answers should be, during which time you will want to demonstrate maximum knowledge and enthusiasm for a career in radiology. The questions can vary greatly, and example questions can be found by searching online. Click here for Interview tips by Radiology Café. This station can feel quite intimidating as one of the panel members may not say anything or even appear disinterested. This is not uncommon and has been reported previously by many candidates, so do not let this put you off. This was a new station in the 2017 interview process, during which two consultants would examine in detail your portfolio and expect you to provide evidence of various aspects of the person specification. It is difficult to specify exactly what you are marked on here, but it follows a similar format to the self-assessment form and categories above, but perhaps in more detail. The important things to note here are that your portfolio should be well organised, well presented and you should be able to navigate it quickly and at ease. This will enable you to provide evidence quickly and gain marks within the station. During my interview, the panel asked me to provide evidence for various aspects of my self-assessment form. They then asked a few additional questions such as “Show me something you are proud of (outside medicine)” and “Tell us about a mistake you have made”. There is an immense time pressure in this station, which means knowing your way around your portfolio is vitally important – especially when you are already in a pressured situation. It is useful to separate your portfolio into categories such as these and use dividers with tabs to help navigate your way through quickly.